On May 12, 2009 the Alisher Saipov annual award for achievements in journalism was presented in Osh, the southern capital of Kyrgyzstan. 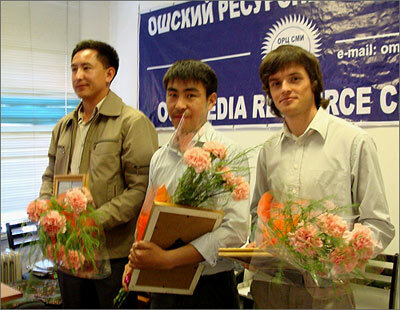 Young journalists from southern Kyrgyzstan became the winners in three nominations. Next year the geography of award will cover entire republic. According to the founders of Alisher Saipov award, this year the prize was given in three nominations: For professional commitment, For active civil position, For adherence to human rights. Azattyk radio correspondent (Kyrgyz service of Liberty Radio) Janarbek Akaev, head of radio and TV programs of Open valley television and radio Oibek Khamidov and Voice of Freedom –Central Asia human rights internet-portal correspondent Ilya Lukashov became the awardees. The awarding ceremony, hosted by the office of Osh Mass Media Resource Center Public association (Alisher used to be its member), was attended by journalists, friends and colleagues of Saipov. Giving a speech at the event, the coordinator of Justice human rights organization Abdumalik Sharipov noted that the nominations had been selected, based on the topics, covered by Alisher Saipov. "We, human rights activists, believe that journalist perform as human rights activists to certain extent and involve in useful and necessary work – Sharipov said. – It’s a pity that we do not have such talented journalist as Saipov. Today, however, concluding the result of the contest we are convinced that the number of such journalist is growing". According to the head of Media-Incubator Public foundation, Abdymomum Mamaraimov, this award is demanded by active journalists, involved in this challenging profession today. He urged his colleagues to support the initiations, related to the award. The prize winner Oibek Khamidov mentioned that his nomination became "unexpected, but pleasant surprise". "I believe this is not only my achievement, but the success of our colleagues and friends that help producing programs under Peace Valley project". "When I first entered the journalism department of Osh University we were acquainted with Alisher Saipov and told that this journalist can teach us many things – Janarbek Akaev, another prize winner, shared. – I wish we had him among us while we receive his award. On the other hand, it is a big honor for me to receive this award. I am confident that the memory of our colleague Saipov will stay forever in our hearts". Third prize winner Ilya Lukashov shared the feelings he had while reading the news about the death of Saipov. "I joined the journalism recently and believed that our profession is relatively safe until the tragic death of Saipov – he said. – It is always nice to receive awards but when you get the award of such rank and for own input and efforts it is even more pleasant feeling". It has to be reminded that the idea of founding the award was announced in October 29, 2007, five days after the murder of Alisher Saipov. The award was established on April 24, 2008, half a year after the death of Alisher Saipov. The founders of the award are Fairness human rights group, Ferghana.Ru news agency (Alisher has been cooperating with Ferghana.Ru for a long time) and Media-Incubator public foundation, operating for education and support of young journalists in Jalal-Abad Oblast of Kyrgyzstan. The award is established in sign of recognition of journalist Alisher Saipov contribution to building free press in Kyrgyzstan, development of journalism in Central-Asian region with the purpose to perpetuate his name and stimulate young journalists, striving to bravely and honestly perform their duties. The prize can be won by the representatives of one of mass media in southern Kyrgyzstan or journalists, preparing the reports from the south of the country at the age of under 35. In the future the award will cover the region and entire Central Asia. There are no language, gender and other restrictions. The degree in journalism is also not required. The founders note that next year the journalist from all over Kyrgyzstan can participate in the contest. Our friend and colleague Osh-based journalist Alisher Saipov was murdered on October 24, 2007 in close proximity to the office of Siesat newspaper, founded by him. Despite the promise of the officials the murders have not been arrested yet. Alisher Saipov worked with Ferghana.Ru news agency, Voice of America radio, BBC and other agencies. The name of Alisher Saipov is perpetuated in the memorial desk in Washington D.C., dedicated to journalists, killed during the performance of professional duties.